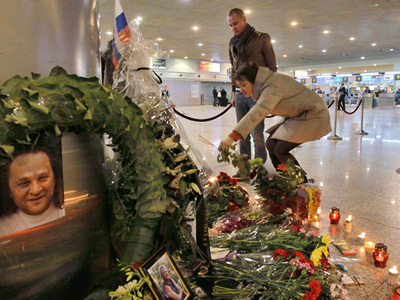 One of the people injured by the suicide bombing at Moscow’s Domodedovo Airport in January has died in hospital Thursday. The terrorist attack killed 35 people on the spot and wounded more than 160, leaving about a dozen in serious condition. Earlier on February 2 one more of the victims died. Investigators believe that the bombing was organized by a militant gang from southern Russian republic of Ingushetia, according to media reports. A number of suspected terrorists including the alleged head of the gang Bashir Kamkhoev have been arrested.